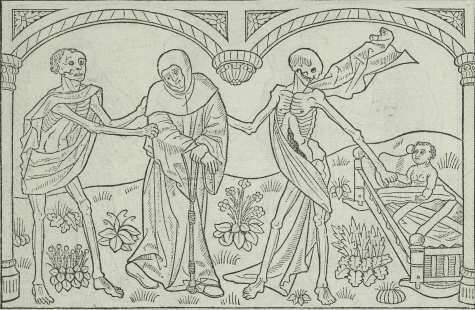 Death makes a last reply to the previous dancer, the shepherd: »Faicte voye vous aves tort sus bergier«. The shepherd wasn't added before 1486 along with the pilgrim, the promotor and the jailor. 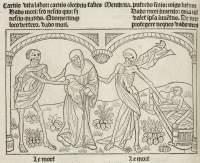 In the original text and in the 1485 edition Death addressed the peasant / laborer: »Faictes voye: vous aves tort Laboureur«. 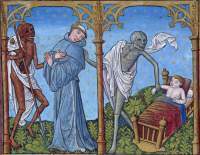 Something similar happens with the gendarme, who was also added in 1486. The child — somewhat contradictory — says he doesn't know how to talk: »A. a. a. ie ne scay parler«. He is a child and his tongue is dumb. The child has almost the same line in "Der Doten Dantz mit Figuren (to the right)": ».A.a. ich enkan noch nit sprechen / Hüde geborn hüde müß ich auffbrechen«. The clever child is actually quoting Jeremiah 1,6: »And I said: Ah, ah, ah, Lord God: behold, I cannot speak, for I am a child« (Douay-Rheims Bible). Several scholars have pointed this out: Massmann, Literatur der Totentänze, 1840, page 88, Florence Warren, The Dance of Death Edited from Mss Ellesmere, 1931, page 113, and Sophie Oosterwijk, Of corpses, constables and kings, page 43. Der Doten Dantz mit Figuren is from ca. 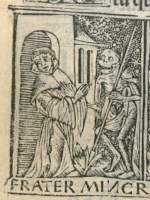 1486-88, and Heinrich Knoblochtzer has probably owned a copy of Guy Marchant's books. 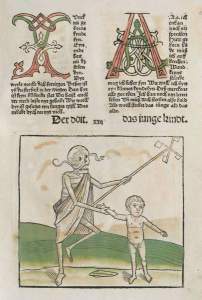 Oosterwijk has also written a monograph on Death and the infant titled "Muoz ich tanzen und kan nit gân?". Much of Oosterwijk's work (including these two) is available on the Internet.